Many people associate bus tours with narrow seats, noisy shaking vehicles, tight schedules and an exhausting return after the pleasant sightseeing. Now there is a good news for all those travelers who want to ride on a more elegant and luxurious bus! In April 2014 the famous bus tour agency Hato Bus introduced their highest class vehicle “Pianissimo III”. This was the beginning of a new generation of bus tours. As a former bus tour guide, please let me introduce the charm of the new vehicle! The best features of Hato Bus' most luxurious vehicle "Pianissimo III"
Number one is the seats! There are only 24 seats which is half than the usual for a bus tour. With only three seats per row there is plenty of space for each individual traveler. The windows are large and provide a great view so even a long ride doesn’t seem exhausting. There are electricity plugs on the armrests which is ideal for all those who want to charge their phones and cameras during the trip. Number two is the lavatory at the back of the bus! There is a spacious and comfortable lavatory in Pianissimo III. It’s totally different than the toilet of most other buses! You can sit on the seat inside and do your make-up regardless of how much the bus shakes. Girls will love this. Number three is the service! They give drinks twice during the trip. If you stay overnight you’ll also be served sweets for an elegant tea time. During the return ride you’ll be given earphones to listen to music, radio or the sound of the two TV sets installed inside the bus. All of this makes your trip more enjoyable. Finally, let’s mention the design and decoration of this bus. It’s jet black, elegant and feels classy. The safety equipment, including the brake system and the seat belts, is made to guarantee the well-being of the travelers. Riding on the Pianissimo III bus with its “seats for noble travelers” will definitely elevate the class of your trip. The overnight trips pick good-quality inns where you can arrive early and leave later than usual. The idea is to spend as much relaxing time in the inn as possible. Also, the schedule is not as crammed as other bus tours and allows travelers to enjoy their time at the sightseeing spots. Travelling with Pianissimo III is a totally different experience. Here I’ll introduce the 2-day trip named “Go with Pianissimo III on a relaxing trip to an open air hot spring: Shimoda Central Hotel, the mountain villa”. This hotel is called the “mountain villa” because it’s located in the woodlands near Izu peninsula’s Shimoda city. It was reopened after renovation in December 2012. This tour is offered with accommodation in the “open-air hot bath and garden” room! The hot bath is large enough to accommodate two people and the only thing you hear around is the murmuring of the river stream. The hot spring is freely flowing and can be used anytime you like. A truly luxurious experience! Try also the large bath! Shimoda Central Hotel uses the hot spring water from the Aitama Onsen source which has high-alkaline thermal water. This is good for people who can’t stand the smell of sulfur and prefer colorless and odorless water with a positive effect on the skin. The hotel possesses the hot spring source so the water quantities are large and enough for the open-air baths in the rooms, as well as for the big bath. Not only that, but even the showers use hot spring water! The large bath has an indoor and outdoor part and can be used from check-in until check-out. 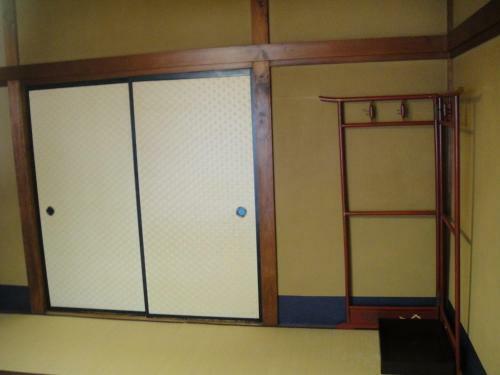 It has been recently renovated and equipped with a rest room, a free massage chair and a place to drink the hot spring water. This is a nice place to visit even if you don’t want to soak in the hot water. From 4 pm to 7:30 pm every day you can enjoy free milk and coffee service after your bath! In most other bus tours the entire group eats together, but at this hotel the tables are separated for the dinner. The highlights are Ise shrimps and Splendid alfonsino fish. Ise shrimps are mostly known and caught in Mie prefecture, but they’re a local product of Izu peninsula too. You can choose whether you prefer them sliced, baked or boiled when you book the bus tour. Their delicate meat is very delicious! Shimoda catches the biggest amount of Splendid alfonsino fish in Japan. Here the fish is served boiled in a sweet sauce. You can also buy a vacuumed package for a souvenir. Eat it plain or with rice. There are plenty of other seasonal ingredients included in the dinner which will make you feel like you’re having a truly luxurious dinner and you’ll forget the fact that this is a bus tour. As this is a bus tour, you will visit many other interesting places. Personally, I quite liked the perfume making experience at Kawazu Bagatelle Park and the walk around Shuzenji Temple’s Niji no Sato park. Many of the travelers enjoyed creating their own fragrance and used it on their handkerchiefs. The park at Shuzenji Temple was wide and full of seasonally blossoming flowers. On the way we could see Mt Fuji and the cobalt blue Izu sea which both added something special to the bus trip. On the photo you can see a moment from the lunch at “Steak Ikeda” on the second day. The beef steaks are cooked with flambe! This was a great visual experience and a very delicious lunch. As a former bus tour guide, I can guarantee that this bus tour exceeded even the highest expectations. The pleasant interior and the driver’s skills made sure that we arrived on time at every place we visited. The bus guide was always telling interesting stories during the ride. For this job it’s important not only to talk cheerfully, but also to pause from time to time and let the travelers enjoy their ride. In order to do this, the guide needs to be really professional and even I was surprised at this bus tour’s guide. The smiles on everyone’s faces said everything about their satisfaction. This bus tour is a little more expensive than the ordinary tours, but it’s definitely worth its price. There are also other day trip and overnight tours with the same bus. You can treat yourself or book it as a present for your family. A high-class experience that will exceed your expectations is waiting for you.